A tree with a light and airy form, whose leaves appear in spring when there is some moisture. 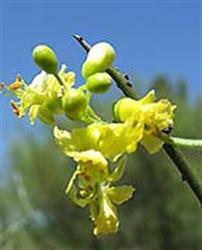 Palo Verde will put on a spectacular spring flower show, when it is covered in 1' yellow flowers flower clusters. Native to desert washes in the South West and Baja, this tree needs very little water and will grace a desert garden or work well as an accent tree in a Xeriscape or other low water garden. Some careful summer watering will lengthen the period of leaf and flower. This is one of the smaller of the Palo Verde trees reaching 12'-20' in height, with a smimilar width. Give careful thought to where it will be planted because of its sharp spines. At the back of a planting area is ideal, but next to a pathway may not be a wise choice. Periodic thininning or pruning can be successful to shape the tree as you desire. Rabbits like to chew on the Palo Verde trunks for water when the trees are small. They'll eat off any tender new growth. Once the trees get to about 5 or 6 feet the rabbits stop touching them.